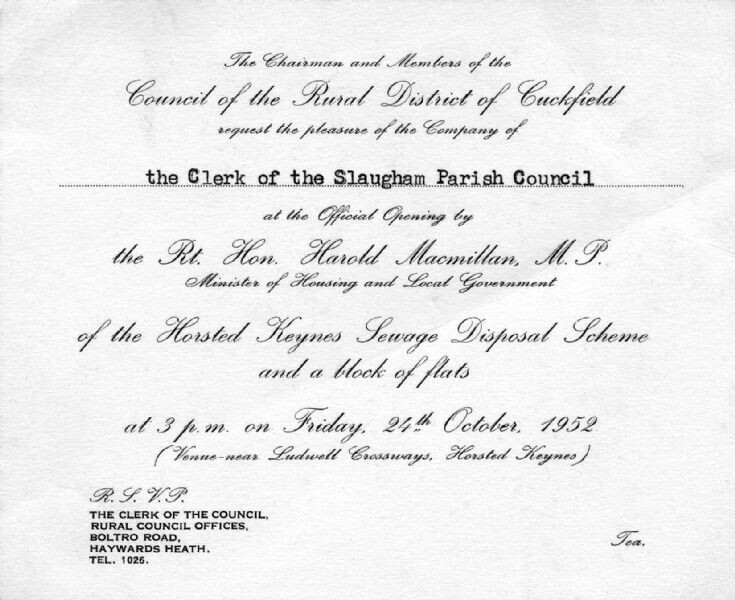 My father, Roger Ray, was clerk to the Slaugham Parish Council in 1952 and he received what can only be described as one of the perks of the job. Now, I do not know if he attended the event, but I would be most surprised if he turned down such a once-in-a-lifetime opportunity! Before the concept of Parish Councils came into being, local matters were dealt with by the Vestry Committee. Their meetings were often held in the vestry, from which they obtained their name, and usually chaired by the vicar. They covered matters nowadays conducted by the Parochial Parish Council, and also secular matters now covered by the Parish Council. I assume my father obtained sight of the Slaugham Vestry Minute Book from which he uncovered the story of a John Barrowcliff who disgraced himself, but managed to save his reputation by making a full disclosure and offering an abject apology. My father’s typed copy of this incident can be viewed by selecting Large Version. I have referred to the Tithe Map of 1842 to search for Lime Kiln Villa, but could find no such name. There are several references to land or woods where the names include the word “limekiln”, though. A search for John Barrowcliff found that he was a significant owner of land in Warninglid, and that he was the owner/occupier of “house, garden, etc”, in the exact location of what we now know as Free Chase! Select Open Document to view two newspaper cuttings relating to matters affecting the Parish Council in 1946 and 1951. Most importantly, the Chairman, Dr. Greville Tate, announced in 1946 that the land for the new estate of Truggers had been purchased and that tenders were being sought to build the houses.